Standard - €23.99 Only 5 left! No great costume is complete without the correct hair-do. For some costumes this means hair that is straight and short. For others, long beach curls are needed. And for yet others? There may be mo-hawks, ear-buns, crazy colors, or hair accessories. Of course your costume might not call for something specific. We like these outfits more because then you can get creative. Should Little Red Riding hood have long red locks? Should the demon from the hot place have short black spikes in their hair? The choice is up to you. 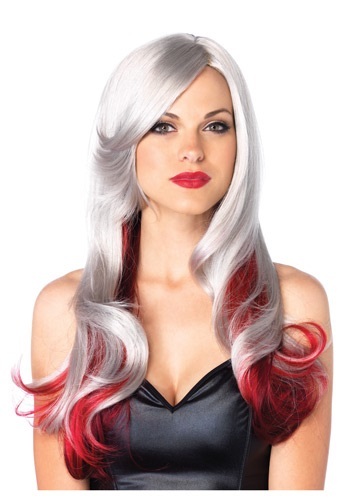 If you're looking for an elegant (but still spunky) hair option, consider our Red and Gray Two Toned Wig. It has long platinum tresses tipped in ruby red. This could be the crowning touch for a vampire, fairy, zombie, or anything else you can think of. Trust us. You'll look stunning in silver.